you can size it yourself! I have included specific instructions for a vest that will fit a dog with a 17.5 inch chest. 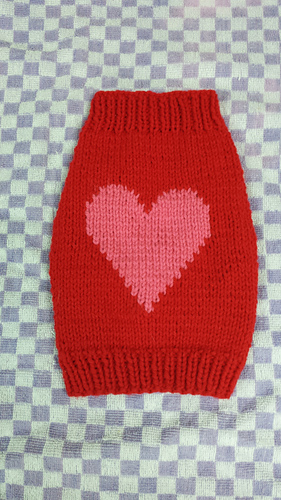 Also included are easy formulas to customize the sweater to fit your pooch perfectly. This is a very simple pattern to make and a great beginner’s intarsia project. Go to www.jojoknits.com/blog for more project info. And please visit my facebook page www.facebook.com/jojoknitting! Consider this a Valentine’s Day present and share the love! PS: I have added a peace sign intarsia chart for an alternate design option. 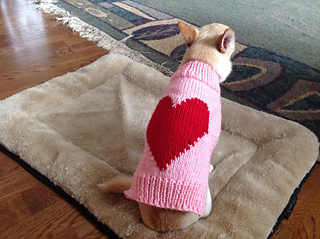 Visit my webpage www.jojoknit.com/for-pets for the free download.